Animals > Squirrels > What Do Squirrels Eat? Have You Wondered: What Do Squirrels Eat? 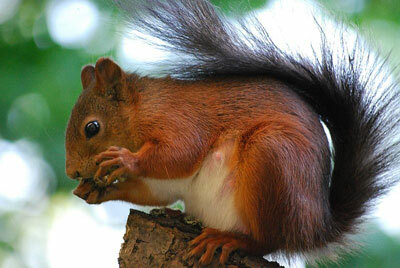 When it comes to squirrels, there are a lot of things that these little critters will eat that make gardeners hate them. Not only are squirrels one of the most hated creatures in the rodent family because of their diet but they are also one of the cutest looking rodents! Squirrels have been an annoyance to many gardeners for centuries and if you are interested in exactly what do squirrels eat, that is what we are going to explore in this article! Most squirrels are vegetarians. There are a few exceptions like the flying squirrel. The flying squirrel will eat small birds, insects and definitely steal eggs from birds nest in order to make a meal. Generally speaking though, squirrels will mainly stick to things that are vegetarian related. The main diet of squirrels is: nuts, seeds, fruits, lichens, buds, mushrooms, roots, pine cones, leaves, twigs, bark, black walnuts, oranges, avocados, apples, apricots. One of their favorites is definitely corn on the cob that is dried and hung up for them. Squirrels are not picky eaters at all and they will pretty much consume anything that is in front of them as long as it tastes good, this is especially true when it comes to flower bulbs! Now that we have explored exactly what a squirrel eats, let’s go ahead and explore why exactly gardeners hate these adorable creatures so much. Well, as you might know, squirrels love to dig and hide their extra food all over the place. This is not just done just before the winter time; it is actually done all year round. So while the squirrels are digging, they are usually not only trying to hide their extra nuts the garden soil, but they are also digging up fresh bulbs that gardeners plant in the spring time. 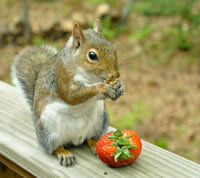 One of the favorite things on a squirrel’s menu is flower bulbs. Something about the taste of a bulb is absolutely something that a squirrel can not resist and if they happen to dig one up while they are hiding their nuts in the soil, and then they will swap it out! This is one of the reasons why gardeners and squirrels simply do not get along at all. Gardeners will spend all of that time planting a whole lot of bulbs only to get half of the flowers that they planted due to squirrels digging up the rest!